This 1926 Maple Leafs was the first International League team to break the Baltimore Orioles storied "Endless Chain" of 7 consecutive pennant winners. 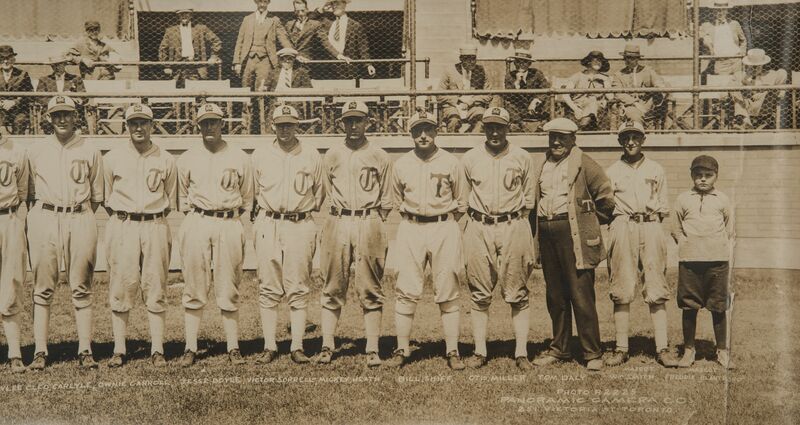 The team was the top farm club of the Detroit Tigers and featured no less than 23 future or former major leaguers, including a 23 year-old named Carl Hubbell. The 7 1/2" x 43" sepia tone print is a sterling example of the panoramic, the most desirable type of team photo. Besides the sheer beauty of this piece, it is even more interesting as it comes from the personal collection of the team's ace, Walter "Lefty" Stewart. Lefty was an 18 game winner that season and later went on to carve out a nice 10 year career with the Tigers, Browns, Senators and Indians. Auction closed on Saturday, April 26, 2014.